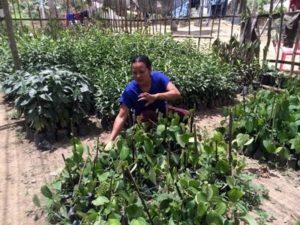 Farmers in Indonesia are more optimistic about surviving the increasingly long dry seasons because the World Agroforestry Centre is improving their understanding of agroforestry and drip irrigation. 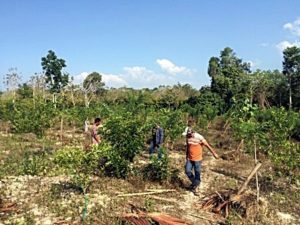 Until recently, farmers in Konawe Selatan, Kendari District, Southeast Sulawesi Province, Indonesia thought that agroforestry was to mix trees and crops together in the home garden with little or no planning or management. The results were not optimal: little or no yields and failed plantings. The farmers were unaware that there were techniques that could be followed in mixing crops, for example, calculating the specific distance between particular species of tree, the suitability of plants for combination and where to plant them in relation to one another. The situation became more challenging because of a prolonged dry season that caused the failure of many crops, leading farmers to experience difficult times. Their incomes were low and they had very little water. With temperatures over 37 degrees Celsius and no rain for almost half a year, many crops died. And if the farmers were able to water their crops, the water would evaporate in minutes, leaving the plots as if they hadn’t been watered for months. To help farmers meet these challenges, the Agroforestry and Forestry in Sulawesi (AgFor) project team has been working to improve farmers’ knowledge of drip irrigation and agroforestry techniques. 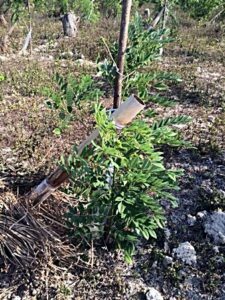 AgFor is funded by the Department of Foreign Affairs, Trade and Development, Canada and the CGIAR Research Program on Forests, Trees and Agroforestry. After two years of operation in Kolaka Timur and Konawe in Southeast Sulawesi, AgFor started in Konawe Selatan and Kota Kendari in 2014. Konawe Selatan has two sub-districts, Lalembuu and Wolasi, in which seven villages participate actively in AgFor. “Farmers in my village didn’t know much about good agroforestry practice until last year,” said Mr Maskuri, leader of the farmers’ group in Unupe Village in Konawe Selatan. Until now, the number of farmers involved in Konawe Selatan has continuously been growing. In the meantime, 279 farmers, 84 of whom are women, eagerly attend all training sessions and workshops on nurseries, seedlings, agroforestry management and commodity crops. Drip irrigation is not something entirely new for some parts of the community of Konawe Selatan. Some farmers had used plastic bottles as water regulators in the past but with very hot weather the water inside is heated to extreme temperatures, exacerbating rather than alleviating the situation. AgFor staff provided technical assistance to farmers, such as choosing the right kind of bamboo, preparing the bamboo, demonstrating installation and ensuring that the water reaches the desired location. Her group had recently received formal recognition from the Governor of Southeast Sulawesi for having the best nursery, including availability of propagators and effective administration. “The award has brought us closer to our dream: to be the best seed producers in the province, particularly in our district, Kota Kendari,” she said. The Mepokoaso group has produced more than 6000 high-quality seeds, such as durian, palm, pepper, local teak, white teak, clove, cashew, rambutan, cocoa, mango and nutmeg. The AgFor team, which has provided consistent support, hopes that the achievements of the Mepokoaso group will provide motivation to other forest farmers’ groups to further develop their gardens.